A group of us were being driven along a seriously scary road in France by possibly the worst driver in the world. I sat in the back, quietly toning the Green Tara mantra over and over. 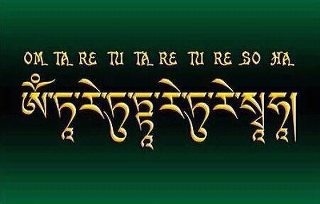 ‘Om Tare, Tuttare, Ture, Soha…’ It’s said to protect you from fear and danger: I just found it incredibly soothing. ‘Oh my God!’ someone screamed as we nearly collided with a huge truck. I didn’t even look out the window; I just stayed focused on the sounds and remained serene. Then the woman next to me picked up the mantra and soon everyone (except the driver) was chanting with me. The mood calmed down, the driver slowed down and somehow the entire car seemed to be cocooned in a protective bubble. The week before I’d been on retreat with yoga teacher Tashidawa and she had taught us a series of mantras. A mantra is literally an instrument of the mind (the Sanskrit word comes from the words for instrument and mind) – it’s a powerful sound or vibration that brings you into alignment with the vibrations of nature. The ancient sages taught that every aspect of nature resonated with its own sound and the Greek philosopher Pythagoras believed that the universe behaved like a vast instrument fitted with a single string that stretched from spirit to matter. His ‘music of the spheres’ theory (that each planet creates a harmonically linked sound) may sound fanciful, but recently it has been discovered that each planet actually does make a different sound. I’d always been resistant to the idea of mantras, shy of my voice, but I found that toning them actually made me more confident. Now I love them – Green Tara is still my favourite but I also love Tayata Om, the healing mantra of the Medicine Buddha, and Gate, Gate, Paragate, which is all about evolving into fearlessness. Check out YouTube to hear how they sound. Of course, the most famous mantra is Om (or Aum), supposedly the most elemental sound of all, the mantra that represents our universal consciousness. Whenever people say that they’re struggling with meditation, I suggest they try chanting Om. There is something supremely calming, centring, grounding about it. I find it lets me sink into a deep meditative state with relative ease, particularly if my mind is buzzing and my body is restless. Give it a go. • Sit calmly in whatever position feels comfortable. • Breathe in deeply and, and, as you exhale, chant Om. It is actually three sounds – aaaah….oooooh….mmmm. When you naturally reach the end of your exhale, let the ‘mmm’ fade away. • Now inhale and repeat. It’s entirely up to you how loudly you chant and for how long. • At first you might feel self-conscious but, over time, you’ll find you can really let the sound vibrate clearly and resonantly. Try to practice a little every day. • Once you’re used to chanting, you can even repeat the mantra silently if you’re in a stressful situation but can’t say it out aloud.